Fleur is our 1972 Dormobile . Her brilliant original interior design is a delight with clever features such as a hide-away cooker, sink and built in coolbox. We have updated her bed this year to make it very easy to use. At some point in 2018 Fleur will be having a break to get a few bubbles in her paintwork sorted out so she may be showing as unavailable. Please do check with us as we may be able to do the dates you are looking for. Fleur carries 4 people and sleeps up to 2 adults and 2 children with a double bed downstairs and 2 great bunks (suitable for kids up to about age 10) in her lift-up roof. We can allow you to bring your dog in Fleur by prior arrangement and depending on how many people you wish to accommodate too - please ask. 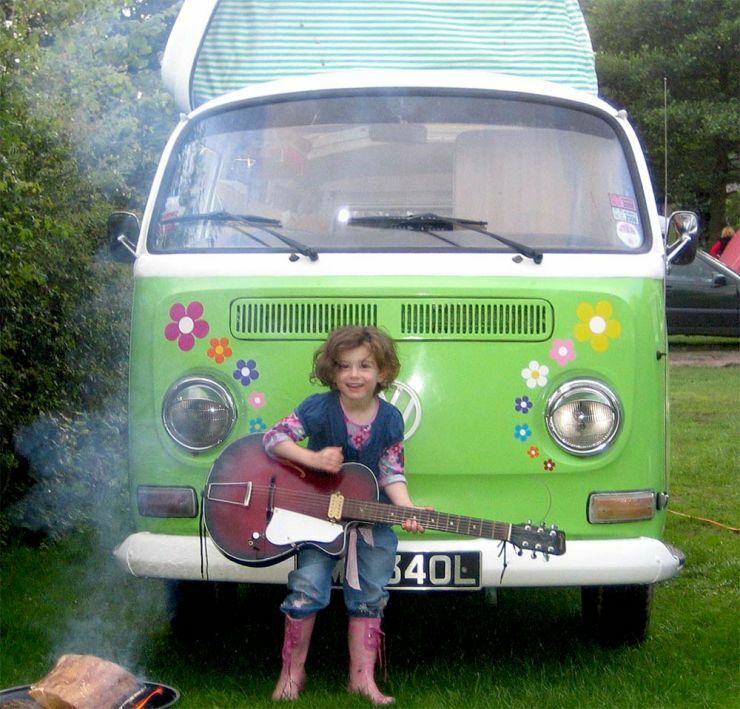 Fleur is a happy go lucky VW Camper Van whose bright green paintwork and flowers on the front always raise a smile wherever she goes.